Exclusive donates thousands of pounds of supplies to all affected by devastating hurricanes. 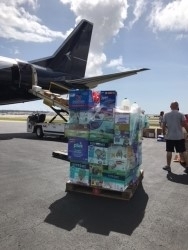 West Palm Beach, FL, October 10, 2017 --(PR.com)-- In the wake of the devastation of past Hurricanes, Palm Beach based private jet company, Exclusive Charter Service has been on the forefront of facilitating help as well as evacuations throughout the Caribbean. Hurricane Irma and Maria has left nothing but widespread destruction throughout the Caribbean and U.S Virgin Islands, even said to leave islands such as Barbuda “inhospitable and nothing but rubble.” After two weeks the island of Puerto Rico is still 95% without power, not to mention without clean water. The aftermath of both Irma and Maria is far more disastrous, roofs of homes missing, walls dilapidated, extreme flooding, government buildings in ruins with no electricity or supplies crucial for survival. Due to all these factors, the death toll is rising rapidly.